DUMBARTON battled to a 3-2 win over Ladbrokes Championship title contenders Hibs at the Cheaper Insurance Direct Stadium — their second home win over the Edinburgh side this season. A 1,345 strong crowd enjoyed a thrilling match as Stevie Aitken's men gained a 3-0 lead by the fifth minute of the second half, Hibs pulled two back, and then Sons held on for 20 nail-biting minutes to claim a thoroughly deserved three points. They took the lead early in the first half when Kevin Cawley beat two defenders before slotting the ball past keeper Mark Oxley. Next it was the turn of ex-Hearts player Christian Nade — the subject of some unpleasant chanting from the visiting fans — to net his first goal for Dumbarton, beating Oxley to a Mark Docherty cross and heading home (pictured). Shortly after the break another ex-Hearts player, skipper Darren Barr, charged in to head a Calum Waters corner into the net for no.3. Hibs grabbed a relatively easy goal back on 57 minutes, when Liam Henderson curled a shot past keeper Jamie Ewings into the far corner. Farid El Alagui narrowed it back to 3-2 for the visitors on 71 minutes. First, Sons were let off the hook when Martin Boyle hit the post. 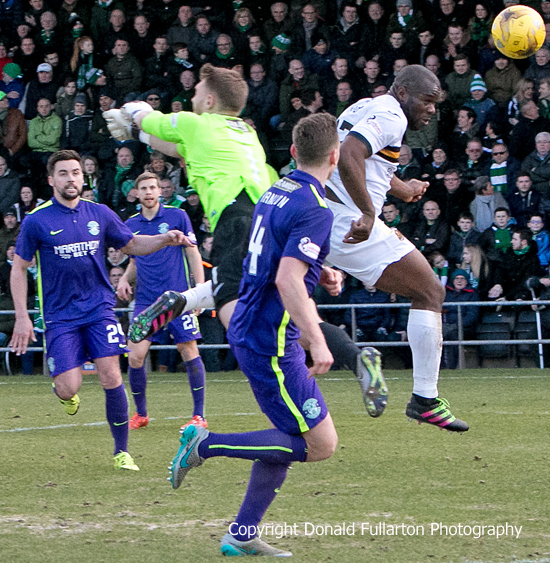 Then Docherty cleared off the line, only for the substitute to crash the ball in from the resulting corner. The visitors then threw everything at the Sons defence, but they held out bravely.